Fully understanding the situation is essential in order to reach conclusions that form the basis for appropriate action. 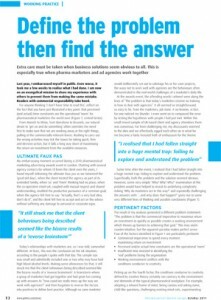 The importance of defining and exploring a problem before attempting solutions is the theme of Andy’s Pharmaceutical Market Europe article. Based on data you already have, our own investigations or a combination of the two, we can gather and assess the facts, identify what’s important and generate the insights that form the basis for the next step, Marketing. Depending on your business needs, our involvement can start and end with Analysis or it can progress into one or both of Marketing and Realisation. Click to find out more about our Analysis services. into something commercially useful for the business."